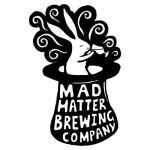 Mad Hatter Brewing Company was set up by Gaz and Sue in 2013, with just one grand in their back pockets, and a glorified home brew set up. The brewery has always punched above its weight, and was championed from the start by the brilliant Port St Beer House. They produce weird and wonderful beers alongside some classic pale ales, stouts and IPAs. Moved from D22, Parliament Business Park, Liverpool in 2017 to new address. Brewery closed down in 2018.